How to find, use, and preserve wild edible and medicinal plants. The plants around the Kohler Andrae State Park, Wisconsin. Especially during the spring we eat wild edibles every day as a normal part of our meals. This meal is a not uncommon fare at our house. I haven't figured out yet if the "weeds" we deliberately let grow in our garden should be called wild or domestic. On the table is Lake Michigan salmon baked with wild leeks on top. The wine jug holds apple wine from last falls pressing of around a 1,000 pounds of wild apples. The greens are stir fried nettles, garlic mustard, dandelions. 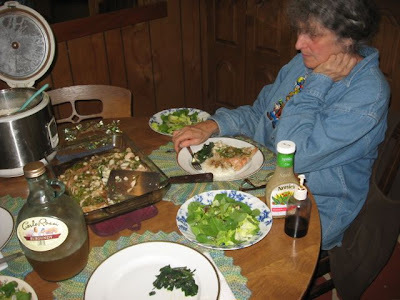 The salad is greens from our garden, violet leaves, etc.